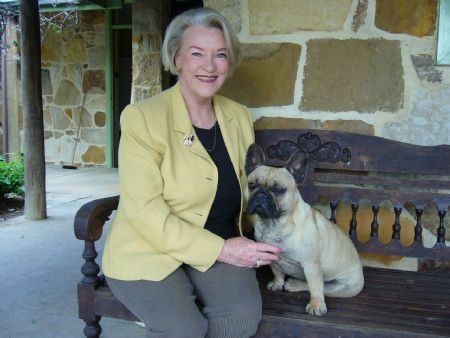 The French Bulldog Club of Queensland Club is blessed to have the support of two wonderful patrons, Lyn Borg from Frogwyck Kennels (pictured below), and Liz Davidson from D'Accord Kennels. I first fell in love with the breed in 1998 when I acquired my first French Bulldog. I began showing him (strictly as a pastime), but soon became more involved when I acquired a second frenchie, a girl. I joined the French Bulldog Club of NSW and became very proactive in regenerating its’ flagging membership. Today, our NSW club is a very active and highly successful breed club, boasting a large membership both within Australia and internationally. I currently proudly hold the position of President, and over the years have consistentlky held many Executive and Committee positions in the NSW Club. I registered my kennel prefix “Frogwyck” in 2000, and with help and guidance from fellow breeders, I bred my first litter in 2002. To date, I have bred 17 Australian Champions and 3 New Zealand Champions, including multiple Best in Specialty Winners. I feel that I have gained a wealth of knowledge during this journey, not the least of which is the importance that breed clubs can play in protecting and promoting our precious French Bulldogs. To date, I have bred 24 Australian Champions and 4 New Zealand Champions. I am honoured to be asked to be a Patron of the French Bulldog Club of Queensland, and pledge my full support to the club. The French Bulldog Awareness Group of W.A. Having been involved in the Australian Frenchie scene for over 25 years and having been through the ups and the downs with you all, I am deeply honoured to be appointed Patron of the French Bulldog Club of QLD. My background in dogs, particularly the French Bulldog began in 1986. Michael and I had no intention of showing let alone breeding but somehow we became caught up in the wonderful world of Frenchies. Under the D'Accord and Kurrallwyn flags we have bred 67 champion French Bulldogs, titled another 9 French Bulldogs owned but not bred by us and bred 10 Best in Specialty Show winners. Three of our dogs have become Grand Champions. The experience I have gained from judging has been invaluable and given me an eye for the differences in type from country to country and kennel to kennel. I have had the good fortune and honour of judging our breed internationally at French Bulldog specialty shows around the world. Our breed is now considered a major breed in the non sporting group and has grown from strength to strength as both a show dog and a loving companion. Breed clubs play an important role and we invite you all to become involved any way you can to "help us help the breed".